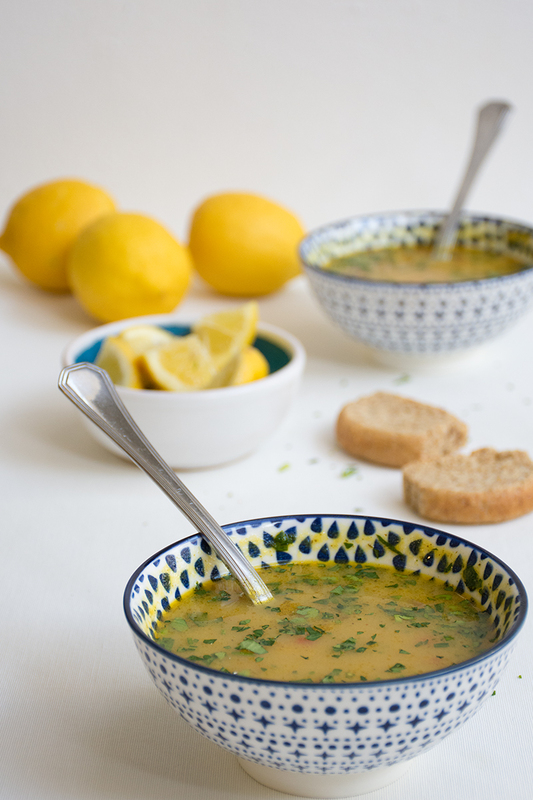 Odyssey's Lemon and Garlic Soup will keep you happy and warm in winter! 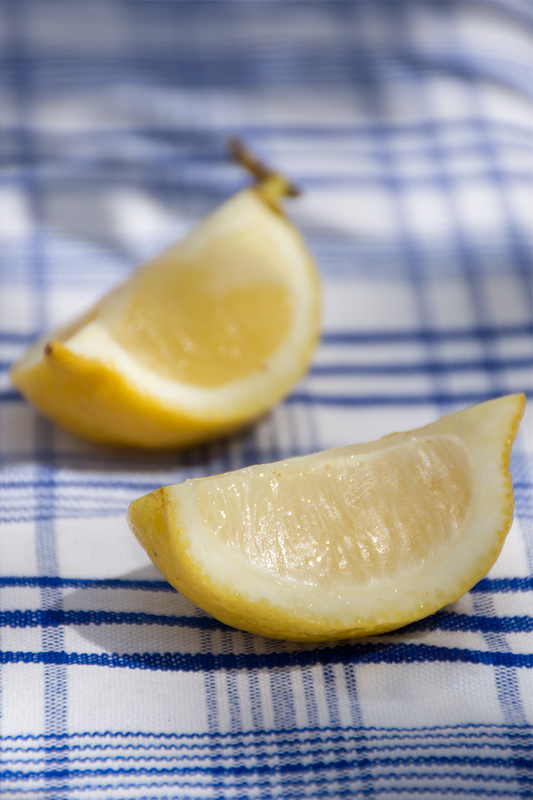 This is not my first recipe with lemon and I can assure you it will not be my last. Many more will follow and all of them will be delicious and full of vitamins and lots of love. 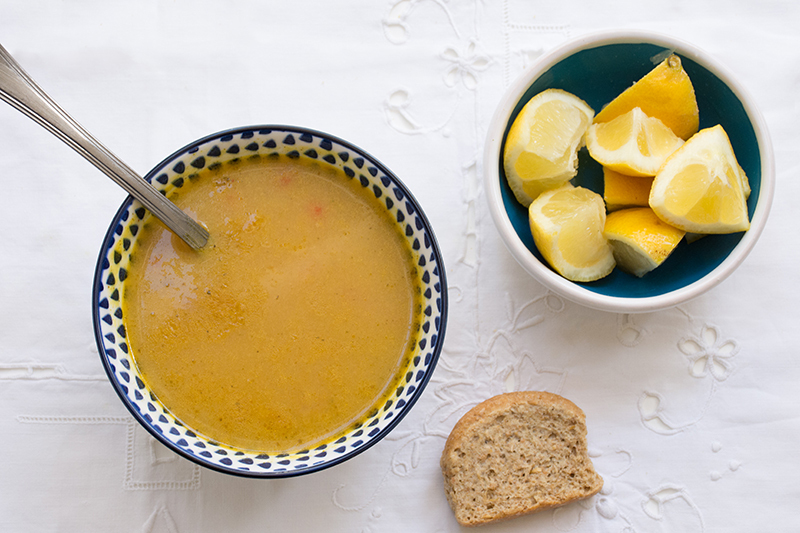 This lemon and garlic soup is easy to make and will keep you warm and happy in the winter! I worked in detail on this recipe with my good friend Thierry. Trust me, he is an excellent and very demanding cook. So, if he says this soup is good, it means it’s excellent! 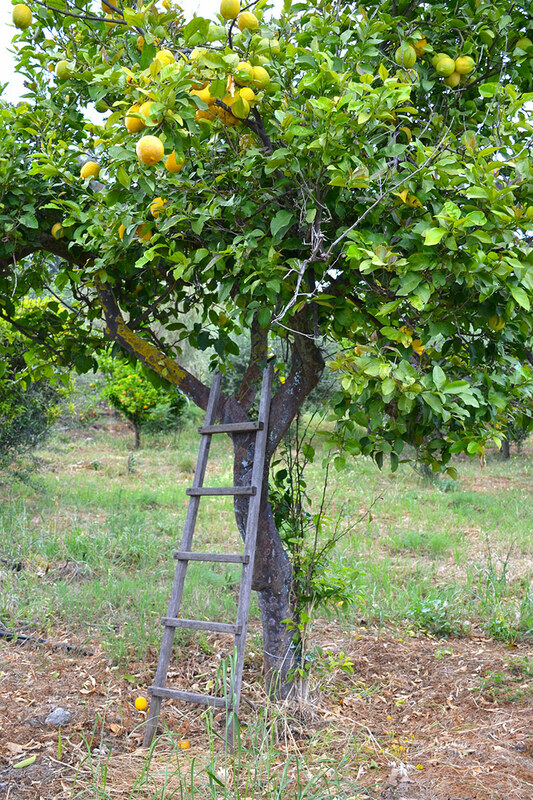 When I see a lemon tree, it reminds me of a young girl, who is ready to spread her wings but instead chooses to stay because she loves the aromas of earth when it rains, and she loves to give presents. The most beautiful present of all would of course be the lemons, but for me having the lemon tree in my garden is a present itself. 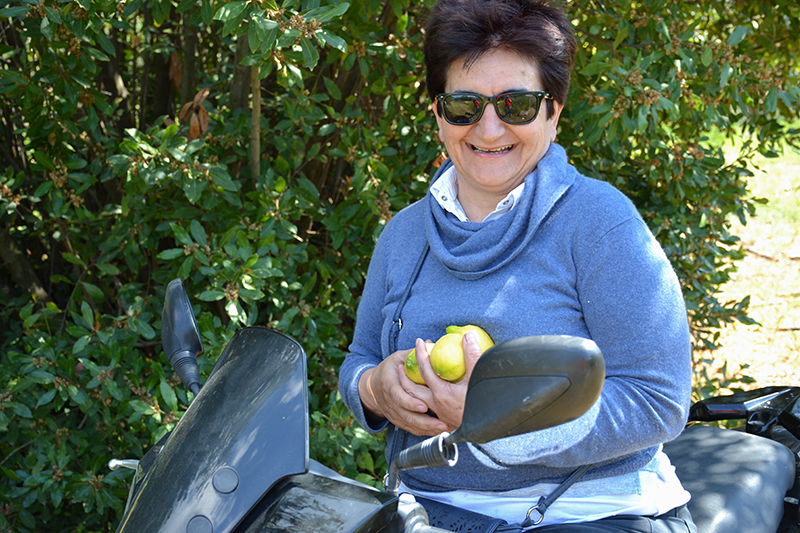 Watching lemon trees every day is a real pleasure for me: Seeing them change through the different seasons; Enjoying the most amazing aromas of the flowers in Spring time; Watching the different shades of green of the lemons throughout the year, for them to turn into the most elaborate yellow colour in the winter. This is the lyric from the song Lemon Tree of the German band Fools Garden. It became a big hit in 1995. Probably there is another deep meaning to this beautiful text, but in my mind it’s all about the lemon forest of Poros. I am thinking of the person that wrote these lyrics coming to Poros, “driving too fast, driving too far”. Lost in our lemon forest, seeing nothing but beautiful lemons. I know that I am wrong about the true meaning of this song, but I love to think that the writer was inspired as much as I am by these lifesaving lemon trees that give us happiness and have such simple earthly beauty! I have made a very poetic entree today, but my intention was to share with you my feelings about my beloved lemon tree, that is the symbol (with of course the olive tree) of our lovely island Poros and its lemon grove. 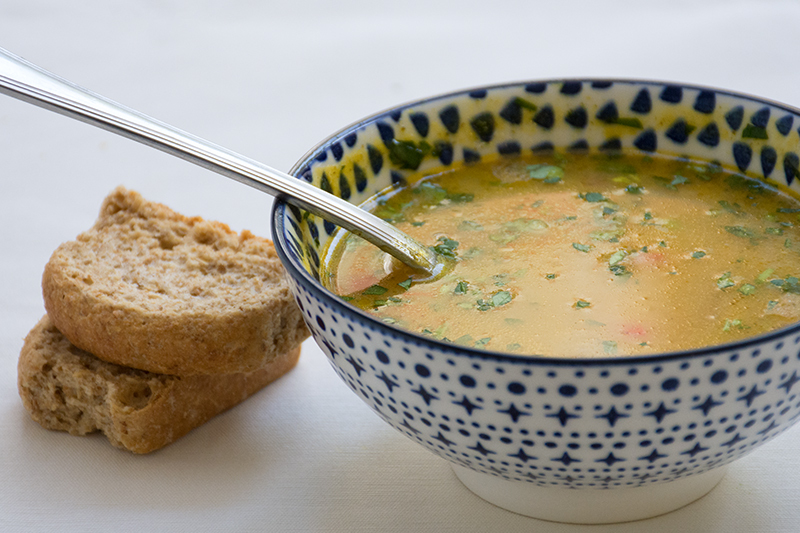 My advice is to find a friend to cook this lemon and garlic soup with, like I did with Thierry. Then listen to this song while cooking and drink a nice glass of wine, it will be a wonderful experience! In a medium-sized soup pan, heat the olive oil. Add the onions, potatoes and tomatoes, and cook until the onions are glazed. Add the garlic, salt, pepper, parsley, fresh oregano, lemon parts and the (hot) water. Boil for about 20 minutes or until the potatoes are soft. You could serve it at this stage with some lemon juice to taste! If you would like a creamy soup then use a hand blender. Take the pan off the heat, let it cool down a bit, take out 3 lemon parts (leaving 1 in the soup for the lemon taste) and carefully blend everything to a creamy soup. Taste it and add additional salt and pepper and lemon juice to taste. Garnish with fresh parsley and red pepper and offer a lemon, for the ones that would like it more lemony, and serve.